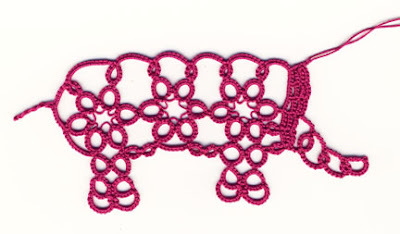 Had another go at tatting a realistic hippo face and am reasonably satisfied with this one, a huge improvement on yesterdays attempt. I am so grateful to Jane for letting me play around with her designs like I do, it is doing so much for my design skills which were nonexistent.. The thread this time was Flora 10 as it is the only size that I ever got this glorious colourway. he measures a whopping 15cm (almost 6inches) and for those who like to know how much thread to use, he took 6m on Sh1 and 5.5m on Sh2. I am now happy that he can go into the water and do his 'hippo paddle' and have his ear, eye and nostrils out of the water (see my hippo photos in my last post). 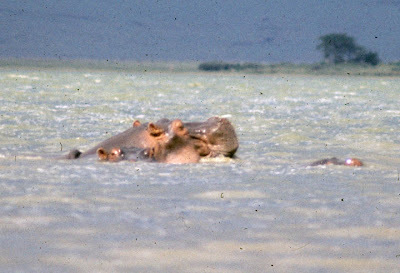 Just had to play with my Tanzanian scene again so here are 2 hippos, one swimming and the other wading in the shallows. 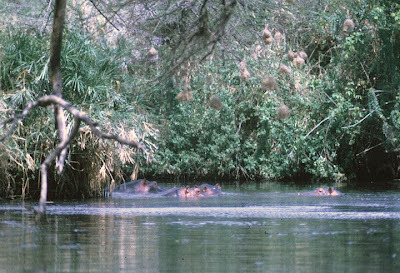 If you want to see hippos on the water and on land here is a super link to a U Tube video. The number of hippos that have come out of the Tat It And See project has been amazing. Lots of people thought that it might be a rhino or pig or even an elephant and felt that they were all very similar and related to each other. I thought that maybe a teeny little zoology lesson might come in handy here (apologies for being a know it all!!) as they are evolutionarly very different. If you are allergic to the science bit then skip the next bit! Hippos and Rhinos are both cloven hoofed animals that walk on their toes(digits)Digitigrade. So it was not so silly to imagine a hippo ballerina as she is already walking on her toes! Hippos walk on two toes and are Artiodactyls. Other artiodacts are pigs,camels,giraffes and cattle, goats and sheep. Some walk on 2 toes others 4 but all walk on an even number of toes. Rhinos on the other hand are Perissodactyls and are odd toed, usually walking on the middle toes of each foot. they are usually fast runners (remember that when you meet a rhino) and include as well as rhinos the tapirs, horses, zebras and asses. Elephants are a totally different ball game, they appear to walk like us on the soles of their feet with their toes pointing forward Plantigrade. But in fact they are still walking on their toes ( no hooves on these tho)with a lot of padding to bring the sole of the foot to the same level as the toes. The foot sort of tilted forward, this is called Semi Digitigrade. Elephants walk they don't run but they do walk at a pretty fast pace. Rant over you can breathe again!! More about elephants when I tat them..that's a threat!! 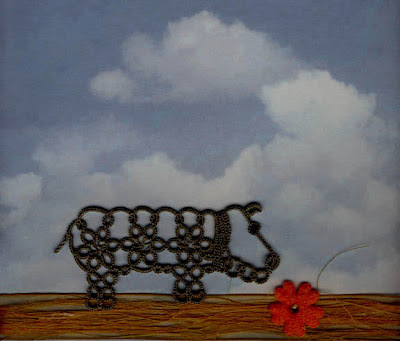 The hippo I made for the TIAS is in the post before this one(in case you missed it). Playing around tweaking Jane's Hippopotamus pattern to give him a pointier ear further forward on his head and a bulbous eye nearer to his ear, together with a flatter squarer head. Here is my first attempt in Coates Madura Red Heart 20 measuring 12cm from snout to tail he is not quite as I want him yet. Second try is in Coates Anchor Perle in a varigated red to brown, he measures 11cm. His head looks better but he still looks a bit too much like a Pit Bull Terrier!! still not quite right, will have to have another go, I think he could do with some nostrils too. these are very important to a hippo as he spends most of his time in water and can close their nostrils to stay under water up to 5 minutes. They come out of the water when it is cool at night to eat grass. Here is my first hippo again...bet you wondered why I had chosen such a dull greenish grey colour. Well when he comes out of the water, rolls around in the mud a bit to keep the flies from bothering him, this I think is the colour you would see as he dries off. Looks like he spotted something tasty to eat. We lived in Tanzania for two years and went on several safaris to the game parks in Tanzania and Kenya. 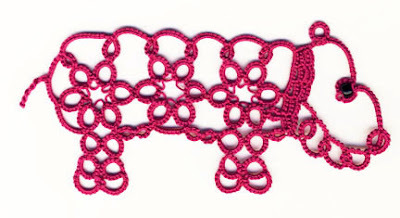 All this tatting of animals sure takes me back, sometimes it seems like just yesterday, sometimes a lifetime ago. People used to say that Africa gets under your skin and it does. Dragged out the box of slides, borrowed a slide scanner and here they are, full of dust and sometimes strangely coloured! wonderful what a little photoshoping can do. We never actually saw a hippo out of the water, just as well as they are one of the most dangerous animals you could meet, very aggressive (especially if you call them fat or ugly!!!!). This group of hippos ( thanks to Jane just found out a group of hippos is a bloat! 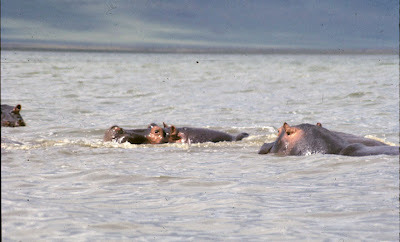 )is in the soda lake in Ngorongoro Crater, Tanzania. Click on the photos for a bigger image. This look like a mother and baby. And this lot are in a hippo pool in Serengeti, could almost have fancied a swim in there to get out of the heat. 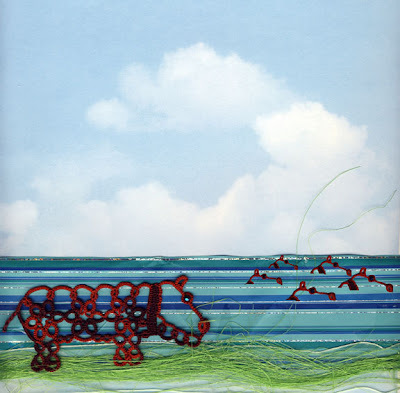 I chose this colour thread as it is the nearest I can get to that lovely shiny mahogany/pink colour that a hippo in the water is. He is making his way back into the water to join his group, just look at that glint of anticipation in his eye. What a wonderful life. 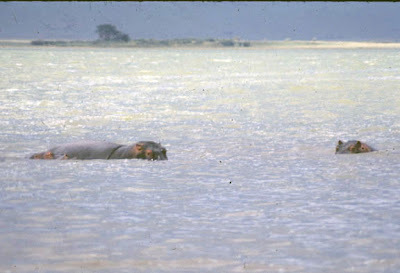 I sincerely hope that the kin of these hippos are still enjoying life in the water almost 40 years on from when these photographs were taken. Tat It And See Day 10 The end. Well here he is the finished tat and he IS A HIPPO!! My guess was correct, that solid body and short legs with feet so characteristic of the Artiodactyls (even toed hoofed mammals). Jane studies her animals well and has a great eye for anatomy. She must have been a zoologist in an earlier life! This last bit didn't go easily for me as I split the thread putting on the bead (which was also much too big), and had a dreadful job extricating myself from a complete disaster. This has been such a lot of fun, thanks Jane for days of agonising anticipation filling my brain with possible outcomes. I do hope she and others will do this again. It is so cool to see so many tatters tatting animals..my all time favorites. With Jane's permission I have been fiddling with the pattern just a teeny bit, so expect to see more hippos coming soon to a blog near you!! Thoughts on Tat It And See Day 9!!!!!!! This is coming along so well, but I think I may have to revise my initial guess...made on day 4 after it got it's back appendage. I say 'appendage' instead of 'leg' as I am beginning to think that it might be an even more fiendish design from the brain of Jane. While I am not going to register this as an official guess, I am beginning to think that it looks an awful lot like a new species of environmentally friendly fork lift truck!! You can see the lifting platform at the front with the reinforced 'neck' area. Balance provided at the back by the solid 'rump'. Wide short legs provide basal support and movement giving a high physical footprint as well as a low carbon footprint!!!! I am now waiting to see if Day 10 produces a seat for the operator, some controls as well as an entrance for the fuel!! Oh and maybe some headlamps. It is of course just possible that the operator walks behind and controls the actions using the small tail like protuberance! Maybe this is destined for the logging industry to help the elephants. The curve of the lifting platform would be ideally suited to logs. Jane has managed to keep me in suspense right to the last moment. What a lot of work went into the design which looks to me like an absolute cracker. My lovely.......is coming along fine. If he isn't a ......then he jolly well ought to be. Oh I just love the colours some of you have used. 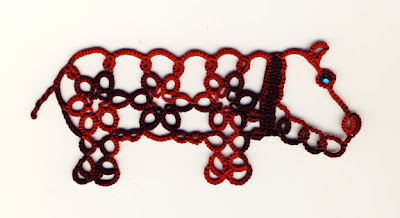 I am already tatting another, and another to look more realistic as that's my aim in this blog. Mmmm might have to make a multi-coloured one too. Brrrrrrrrr!!! It's winter and although we very rarely get any snow to speak of, thoughts do turn to icy things. 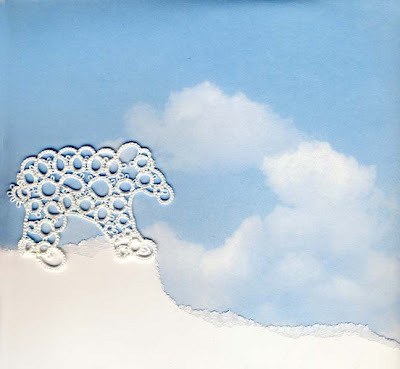 Global warming too and melting icebergs all make me think of the fate of the polar bear. 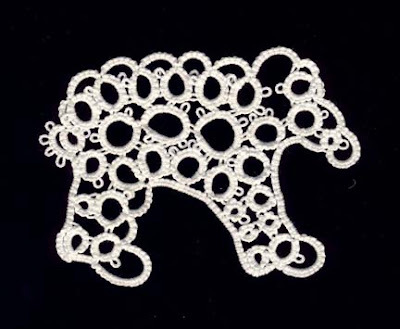 Searching for a polar bear tatting pattern I found one by Mark Myers. It was a bit tricky to follow because there was no diagram and the picture was rather small and indistinct so my first attempt was a learning experience. Second attempt was in size 10 Coates Mercer Anchor (best thread ever)he is 9cm tail to nose and stands 6cm tall. I am very happy with this 'cool' fellow, thanks Mark. Here he is against the pure blackness of the Arctic sky. Better to show him in his daytime setting surveying his world. I only hope that we can all make enough changes in our lifestyles to secure the future of this beautiful environment and of our own. Jane Eborall set out to banish the winter blues from us tatters with her Tat It And See project. 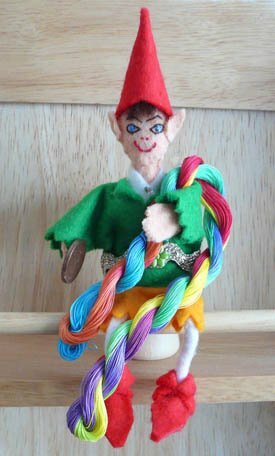 It seems to have been such a success that the whole world, yes really the whole world...tatting world that is of course...is holding it's breath in anticipation of the next part tomorrow. I have managed to get up to date with part 4 and to form an idea of what it is going to be. Lips sealed tho', don't want to spoil it in case I am right...or look a fool in case I am wrong!!!!!!!! 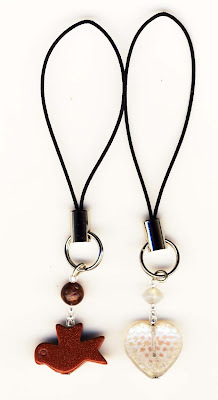 Jane Eborall has just posted about her pair of tatted hearts and a new variation that she has just made. Jane kindly suggested her pattern when I was trying to come up with something to tat to give to every guest at my daughter's wedding in 2006. My daughter wanted to show off her mother's talents...who could say no to that!!! Tatted my way through 260 hearts..that's 130 pairs. Well no, not quite true to be honest, Jane offered to help when the task became daunting which it did. 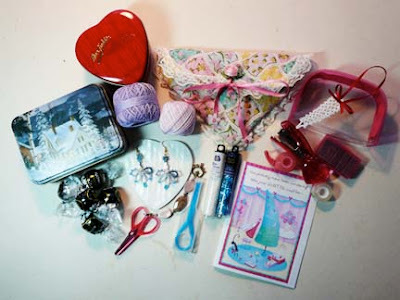 I was so happy to receive an envelope full of little hearts and to see how different her tatting was from mine (much more relaxed compared to my tight little things). Finally decided that would serve a double purpose with the guest's name on the back as a table place marker and a souvenir bookmark on the front. Slipped into plastic sleeves they will last forever. Sad to say that both my husband and me left ours on our table while we were busy chatting and the staff cleared them away and they were never seen again. Good job I had made spares! This photo did already get an airing at the time of the wedding on my other blog click on the wedding label and scroll down to Aug 10th 2006, but no harm to show them again now they are topical. 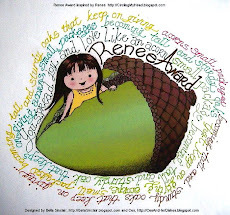 Jane also tagged me for a 'You Make My Day Award', I could list another 10 blogs that make my day but then that might leave more people thinking that theirs don't get read. So I had better leave well alone and get back to blog reading. I have been tagged by Gina for a Make My Day Award..that certainly made my day!! The rules are to "Name up to 10 people whose blog brings you happiness & inspiration and makes you feel happy about Blogland." Beware! You may get the award several times! Let them know by posting a note on their blog so they can pass it on. Gina says that she likes to follow my blog because I am someone she has met and I love to follow hers for the same reason. 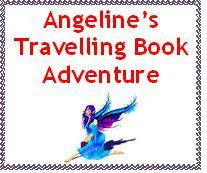 So I have to ask myself what will make others want to read my blog, why do I write it and does anybody else read it. 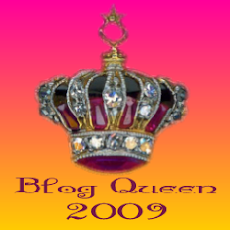 Since I started this challenge blog in Jan 2007 I have had no idea if anyone else was reading it other than the few who leave a comment. 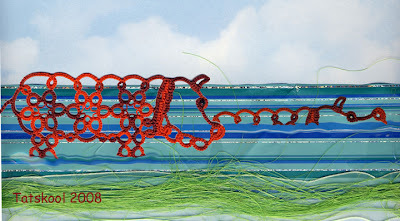 In getting my tatting website up and running, ( and incidentally I have just updated it to run better and have more features and more photos) I put a counter on it and was inspired to put a counter on this blog too. Now instead of tatting I am spending my time checking my counter which has proved to be fascinating(I guess the novelty will eventually wear off!). In 5 days I have had over 130 visitors coming from all over the world. I am absolutely amazed. They have come from all over the United States, Canada, Australia, Japan, India, Chile, South Africa, Germany, Poland,, Bosnia & Hertezovina,Turkey, Italy, Hungary, Egypt, Austria, Bulgaria, Czech Republic, United Arab Emirates, and of course UK. So lots of people do look at it but why do I write it. Is it showing off for personal gratification? Definately not! 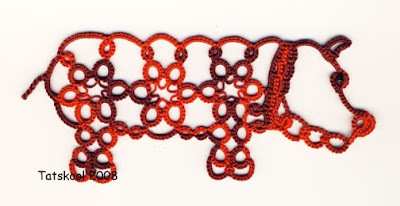 It seems to me that if this wonderful tatting community that the internet has spawned is to survive the we need to communicate with each other. We must share what we can do to encourage and inspire others, who will in turn encourage and inspire us to explore new ideas. The final purpose of a blog is to entertain verbally and graphically and maybe Make Your Day, so that even if you never step outside your door you will feel that you have met and talked to so many friends each day and maybe will have learned something new. 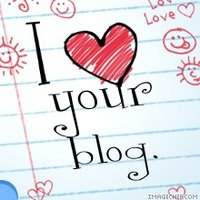 All bloggers make my day but I have to choose my favorites..very hard there are way too many. 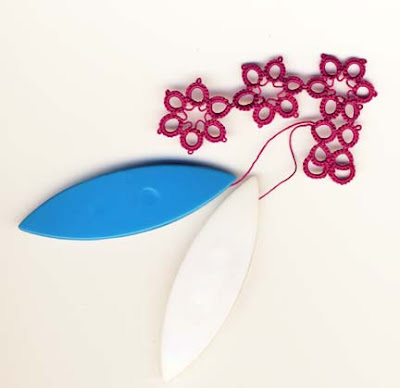 Tatting and not a lot else never fails to do all of the above desirable blog things. 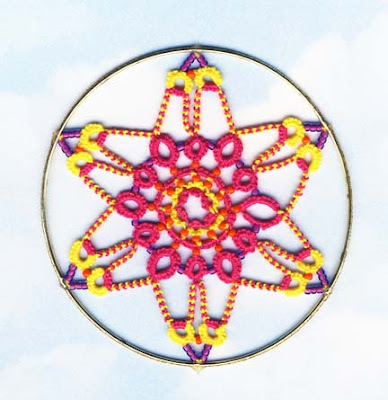 Threads from a Tatting Goddess is packed with information, trivia and companionship. 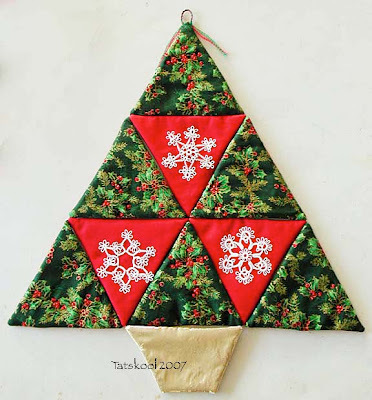 25 motif challenge blog is the blog of all blogs, packed with the work of other wonderful bloggers. An awful lot of work goes into compiling this one but it's so well worth it. Laura's Tatting Muse I love to read. 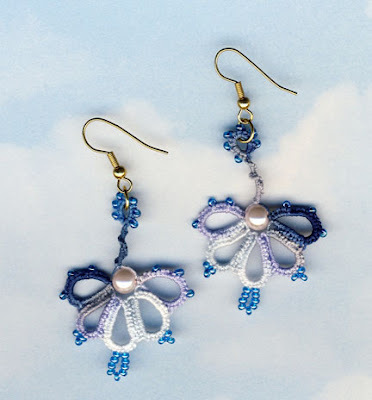 Iris Neibach, Martha's Tatting Blog, Tatman are all by such inspiring and talented people. I could go on and on but can only pick 10 but I do read many many more. To finish this post I must show something to inspire etc you. Nothing new in tatting as my first job after 3 weeks of Christmas lazyness is to tat ginger cats as a good luck token for my SIL's neighbour who is having cancer treatment. So I will show you some of my favorite Christmas gifts we received from our friend Kat from Biloxi, Mississippi. Kat's house was destroyed by hurricane Katrina. She was/is an avid beader and had a huge collection of beads most of which she says is now in the hands of the mermaids. What must it be like to lose everything I cannot imagine. She painstaking recovered as many of her beads as she could from the mud and debris that engulfed her house. Every bead including the seed beads was meticulously washed and disinfected and it is these Katrina survivors that make up her Christmas gifts to us all this year(the others bookmarkers have already gone to their respective new homes). Very, very sentimental and much appreciated. They made my day!! Thanks for visiting see you soon. 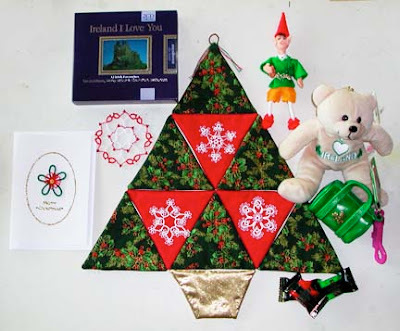 Here in Ireland the last day of Christmas, January 6th is known as Women's Little Christmas. Christmas is nearly over, all the food has been cooked, the work done and the family satisfied. Today is the day for women to abandon their families and the chores and go out and enjoy themselves! I haven't lifted a tatting shuttle for nearly three weeks but I haven't been idle either, more about that later in this post. Just time left for me to show you one of the things I made for Christmas. Couldn't show you before as it was part of a Secret Santa gift and others were also going to friends and family. I made 8 in total, a labour of love. It was one of those things that looked so stunning that everybody had to have one...well almost everybody! I must show you the tatted items that I received from various friends. It's an absolute delight to have pieces of other peoples tatting, never underestimate how much a tatter values these things. From Mary Donohue my Secret Santa came this beautiful icicle, my first icicle. the pattern I think is from Workbasket. She also sent the most gorgeous earrings on shepherds hooks just as I like. I don't remember where i have seen this pattern. Here are all the things she sent me The photo doesn't do them justice, especially her special housewife. 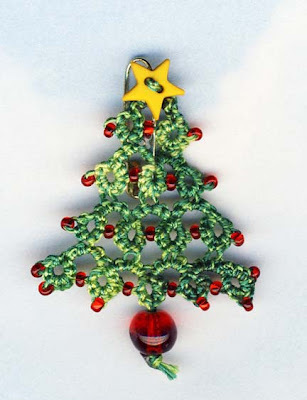 From Jane Eborall came her special 2007 Suncatcher and Christmas tree brooch. You actually have to own something from Jane to be able to appreciate the sheer life and vibrancy of her colours. From Sally Kerson (Jane's sister) came a suncatcher of her own design and some spare sequins so that I can have a go myself, and a very eccentric gecko pen to add to the collection (which got bigger over Christmas but that's another story). I received nine handmade cards this year, the quality gets better and better. I would like to show them to you but none had tatting on and I must not make this post too long. 1. 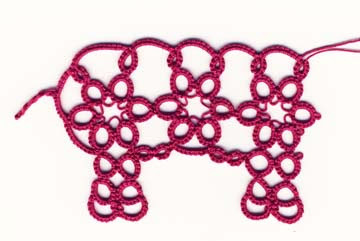 To put some tatting up on my website. I have had this site for some 7 years or so and have never had the ability to design for it and to be able to update it regularly. 2. To tat 25 more animals for my challenge, this is going to be hard timewise, animal wise I can easily find another 25. 3. 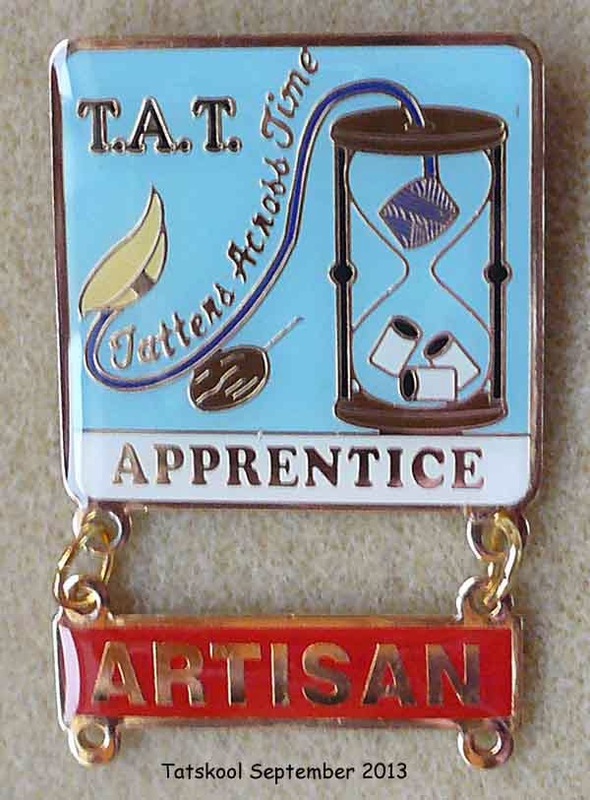 To finish my TAT Artisan programme, this will be even harder. 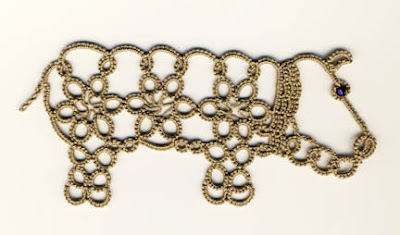 Well I am very, very please to announce that I completed my first wannado on New Year's Day and got my tatting website up and running. It is still in the 'beta' stage of trying to iron out little glitches and getting it to run faster. I would appreciate any the crits and advice. Some things will be better in the next version...like a downloadable pdf pattern, other things are too hard to fix, such as the slide show is manual. There is not a lot on it yet, just my pattern and photos of all the animals on this blog, which seen all together amaze me! 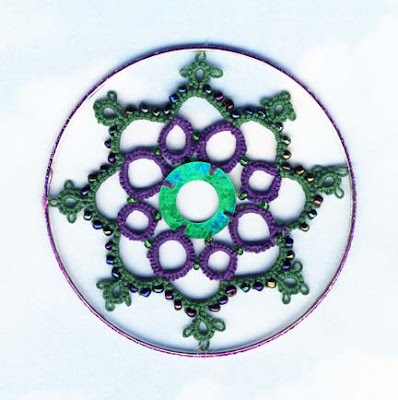 I am already working on my next photo album which will be of Christmas tatting. I want there to be lots of Tats-kool and also some Tat-skool so I hope you will enjoy it. You can get straight to my site by clicking here or on the link on the left of this blog.